One might say that these names constitute an unlikely trio. They do. Yet, in key events of the Twentieth Century they reflect a common theme, each of them from a very different perspective – and each with a very different influence in his own lifetime. It so happened that I had completed downloading The Fog of War (2004) from the internet, and decided to play it. From behind my desk it was almost like a two hour conversation between Robert McNamara, well known for his time as US Defence minister at the height of the Vietnam War, and me. But he was talking to an invisible interviewer, very intensively and with very little if any effort to conceal his emotions when touching apparently sensitive memories. McNamara served the Presidents JF Kennedy and LB Johnson, or – as one perhaps should say – he served Kennedy first of all and continued to serve Johnson until by the end of 1967 his position became untenible in the severe loyalty struggle that ensued in the last part of Johnson’s presidency. Soon after, McNamara became President of the World Bank and thus continued, almost without a scratch, his commendable career into the early eighties. Next, the 3-part miniseries was televised about Nazi-architect and Armament minister Albert Speer and his relation with Adolf Hitler. Speer was one of the few of the NAZI-regime to be saved from hanging, getting a 20 year prison sentence instead, most of which he spent writing his Spandauer Diaries and ultimately his memoirs, without ever again talking to the remaining Hitler cronies. He was a free man in his last fifteen years until his death in 1981. To this day it remains somewhat of an enigma whether Speer was in fact a cunning opportunist or a true, be it naïve genius who simply got caught on the wrong side of the fence and didn’t know how to get out of it without jeopardizing his life or that of his family. His memoirs drew a large public as they provided the only credible first hand account of the inner workings of Hitler’s kllingmachine, admittedly without Speer himself being an immediate accomplice of its most horrid undertakings. But they never fully answered the question – nor did Speer himself in any of his further public utterances – whether or not he carried at least some of the blame for the prolonged agony and death of so many people, including Germans, unprecedented at any time in History. Albert Einstein of course is the odd man out compared with McNamara and Speer, as he was a remarkable man in his own right and not a technocrat serving some one else, let alone living the life of a loyalist to dubious causes as can be said of the other two. Yet he too had helped to open a Box of Pandora, and singlehandedly he had let the world eat the forbidden fruit of Physics which ultimately led to the advent of the Atomic age and the Era of Nuclear Deterrence. Thus it struck me that these three men represent – what I would call – the Dark Side of the Twentieth Century, largely without any of them wishing to have part in it, yet all three of them being highly instrumental in enabling the darkest side of humanity to do its devastating work. There is no doubt that these three men have struggled with this fact in their own conscience, as McNamara – who is the only one still living – apparently continues to do to this day. And there are of course, many differences. 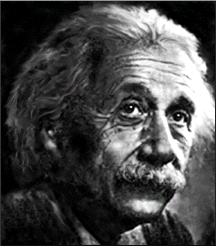 Einstein never, even remotely, actively participated in the planning and construction of the Atom Bomb. He saw it coming, and as he did, he tried to stop it. 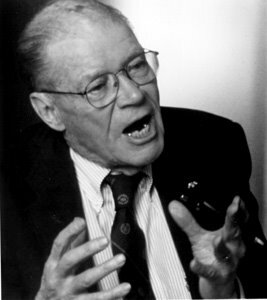 Speer but also McNamara did participate in the organisation of evil, as McNamara readily admits in his account of the dilemma’s that – in particular – the people of the Johnson administration faced when they couldn’t just turn their back on Vietnam. 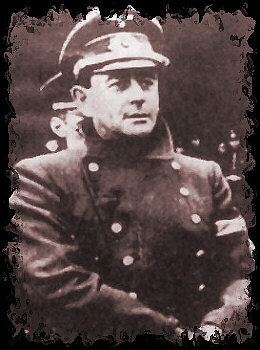 They were the prisoner of the perceptions of their time, as ‘The Fog of War’ so clearly demonstrates, probably in a similar manner that Speer’s vision was fogged by the misleading appearances of the Hitler era (in particular in its first stages) – and in many ways, both men were left with an emerging hindsight that they had grossly misinterpreted the realities of their time, and that they would have to come to terms with this (if only in their own troubled minds) if ever their souls were to find peace in the afterlife. Einstein struggled with a similar sense of responsibility, and who can say what peace his soul has found in the mean time. McNamara presented a number of Lessons as he emerged out of his own fog. There is an obvious merit to these lessons. Not only to they serve us to better understand the complex dynamics of good and evil in the larger part of the Twentieth Century. Most certainly they can help us to better understand the fog prevailing in our own era. But we should never loose out of sight (however troubling this may be especially in a fog), that this phenomenon works both ways. We can’t simply say: the fog is with our enemy, and not with us. Empathize with your enemy! – one of McNamara’s lessons. We cannot simply say: our world is good, and any world that threatens us is evil. The dilemma’s in our own time are obvious, and the outcome of our endeavours are far from clear. Perhaps we need that other great achievement of the human mind, of which Einstein is its greatest icon, to prevail in our own perceptions of time, of good and evil, and right and wrong, before we can actually clear the fog that is permeating our lives today. The true understanding of Relativity. It is how we move, where we go, or where we stand at any given point, that perhaps can give us a clue, a slight hint, a minute insight into how we can achieve peace for our own souls once we reach that threshold ourselves.